On Sunday, as you all know, Tropical Storm Irene rolled through, bringing down tons of trees, causing flooding, and taking out the power of my town and that of many, many others. Sunday we were pretty much trapped in our neighborhood due to the flooding, and we sat around with our neighbors playing Apples to Apples in candle light. That was all fine and nice, but on Monday when there was still no power I started to get a little anxious. Rumors are circulating that we might not get it back for a week. Not cool. Since it was sunny out, I went out, drove around town, all the traffic lights were out. I went to the beach, read my favorite comfort book, "Something Borrowed" cover to cover, got a little sunburn, and went to bed early. Since my office is a few towns over, and they got power I'm at work today, hence this post, frantically typed during my half hour lunch (what? I'd rather blog than eat; go on and judge). Fingers crossed I get my power back soon!!! These photos are from Friday, which was probably the most beautiful day all month, weather-wise. I wish I could just have it over and over and again. Love this outfit!! I would have never thought to put that skirt w that top...very encouraging to get me to branch out! Hope your power comes back asap! My parents have been out of power as well. I don't know how I still have it! You look so pretty in this outfit-very ladylike! Love the pleated soft skirt! A beautiful outfit for a beautiful day! I LOVE that top, especially paired with the gorgeous pleated skirt. Good luck with your power! Oh, man! That does look like the most beautiful day in the world!! Your outfit and smile speak volumes about how beautiful it was. Hope you get your power back. I do hope you get your electricity back, it's amazing how much we rely on it. And this outfit is pretty and demure. Especially adore the skirt! This is my favourite outfit ever on you. what? I'd rather blog than eat; go on and judge. I hope you get your power back soon! Back in 2008 when Ike hit the south we didn't have power in my house for 17 days! wow i love your skirt!you look very pretty! Gorgeous outfit and photos. And, of course, I love the pleated skirt. Sorry about your power being out - that's rough, but I'm glad you're ok. I've been thinking of you and all the other New England/New York/East Coasters that I follow. I'm glad to hear that you're OK, but I hope the electricity returns quickly. Apples to Apples with the neighbors is fun for one night. Then, I'd prefer to be able to use my computer, charge my camera battery, keep my fridge cold, etc. etc. i want that look! The skirt the top the belt and heels... we are having a date night this weekend. I'm going thrifting! Oh no, still no power? I've been wondering how you're doing. It's about half and half here, and one of my friends still has no land line service either. I love this outfit! Friday was pretty nice here too. That pleated skirt is a ridiculously perfect summer piece. I hope the power comes back soon. That is a lovely skirt. Oh man, I grew up in Maine, and when we lost power, we really LOST POWER. Like for weeks sometimes. And guess what else? We only had electric pumps for our water, so no power also meant no showers or flushing. So, I hope that's not the case for you! At least you still look clean in these photos! Wow! This outfit is amazing! Luckily our power never went out, but rumor has it there are people a few towns over who were told they will try to get everyone back by Sept. 4...crazy! i hope you get your power back soon and the recovery from all of this goes smoothly ... but in on the bright side, that skirt is amazing, I want it!! and the purse, I thrifted on almost just like it ...crazy!! oh man that blows. I hope you get your power turned on soon. We lost power for almost a whole day and I was already freaking out. that skirt is amazing. i'm glad you stayed out of harms way! Not power...hope it's not too hot without a/c. Such a pretty twirly skirt!! Very feminine. I love it. I', glad you are okay, another beautiful outfit, I love it, everything is perfect. I hope the power comes back soon and please send the rain my way, we really need it the temperatures have been above 100 every single day. I love everything about this post - your outfit is just lovely, and the photography is great! I especially love the light in the first shot. I love love love this outfit! So romantic and frilly! My husband is being deployed to New York to help with cleanup. I hope you get your power back soon! Glad to hear you are okay and things are mostly back to normal. Hopefully you get your power back up soon, I would be going nuts without it too! Wow, those pictures are GORGEOUS, best lighting ever! So sorry to hear about your power situation! Hopefully it comes back soon. That pleated skirt is absolutely gorgeous. What a lucky thrifting find. Hope everything's back to normal. Love the soft pleats on your skirt. I am very sorry about your power situation. We were extremely lucky, we never lost power! You are welcome to drop by anytime - you know for shower, or coffee or dinner and I am dead serious! Yikes, that's too bad about your power being out! But I'm glad to hear that you and your family are okay otherwise. I love Friday's outfit - the shirt is so pretty, and it's such a great color for you! I was wondering how you made out in the hurricane when I didn't see any posts from you in the last few days. Crossing my fingers that you get power back soon! You are such a great photographer! 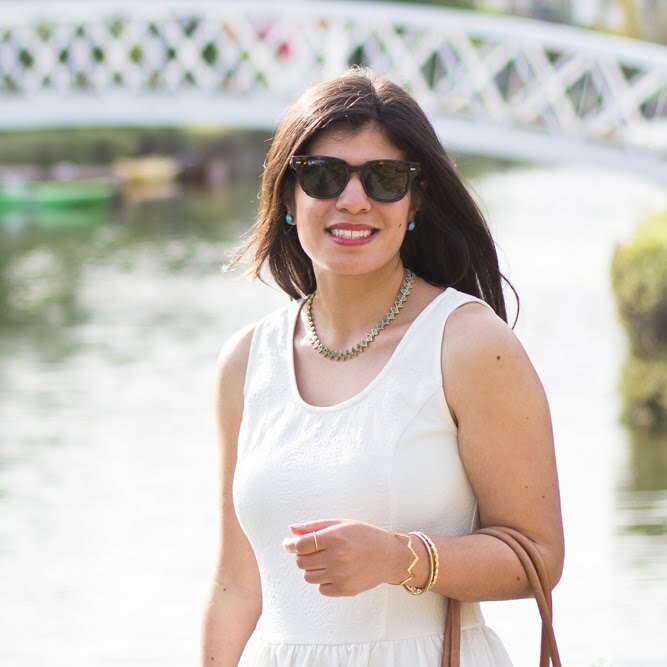 Your photos look fab and I love your outfit; very summery, chic and feminine. I hope your power is back on now lady! Meg had to deal with the same thing. Ugh. As much as I love food, I think I'd rather blog than eat too, so no judgments here! I hope your power is back soon! That outfit is gorgeous, and that picture of you twirling your skirt is amazing! You take some awesome photos lady!! Glad to hear you're ok ... I think this is my favorite look for you. You look so pretty! So sorry your area got hit so hard by the flooding. Hope power is restored to you soon. That Friday outfit, freaking gorgeous. OMG, did you really put this outfit together in the dark? That is a shame, I couldn't have put it together with all the electricity in the world. It is classic and beautiful. Bravo! The skirt was a great find. I'm from central Connecticut and really enjoy your blog! My Hubby and I stayed inside all day Sunday watching the storm pass through and (thankfully) we had power, so I spent a lot of time visiting my favorite blogs...you definitely came to mind and I hoped you were making it safely through the storm! I hope you get your power back soon; I know how it can be an inconvenience! we just got our power back this morning at 2 a.m. i hope things work out for you. & your outfit is perfect! so pretty and chic. Gorgeous, gorgeous photos, glad you are safe! i'm so glad you made it out of the hurricane ok! i'm totally crushing on your white pleated skirt -- can't believe it's a thrifting find! and you seriously know how to accessorize. loving those bracelets! Hoping you get your power back soon. I love your pretty outfit and photographs. These photos are beautiful (the outfit photos, i mean) The light is amazing and I LOVE the outfit itself :) Sorry to hear about the power. Can't imagine how life would be without it! Is it back already? Fabulous outfit. Hope the power is back on ... so much we take for granted. I hope you get your power back soon. I love the skirt. Well, at least it is JUST the power that went out and nothing worse - hope everything goes back to normal soon! That outfit of your is lovely - I adore your skirt! Love this outfit, the skirt is too cute.. Your outfit matched the weather because it too was beautiful. That top is absolutely stunning! Glad you all made it through Irene safe & sound! I've been reading your blog for a while now and just realized you live in CT too! I'm from the Norwich area and curious if you are close by? We got our power back after only 36 hours. I hope it won't be too much longer for everyone else. These photos are so pretty! I'm currently searching for my own pleated skirt. I hope your power comes back soon- I remember the blackout of 2006 and I did not cope well. Wao, these outfit pictures are absolutely beautiful! Sorry the power is down, hope you get it back soon! Lovely skirt. Every time I see a pleated skirt on a blog I rush to see where the blogger got it from then I find it's thrifted or too expensive. I am super extra jealous of that thrifted skirt. I never fair well finding skirts or bottoms at all in the thrift store. Time to renew my dedication I suppose. Love this whole look, very pretty. That swirling skirt photo is seriously one of the most lovely things ever. Frame-worthy! And I certainly hope that your power comes on again. For 1000s of years we lived just fine without it but when it's gone... it's upsetting!! Take care of you! I love this outfit, the skirt is fantastic!